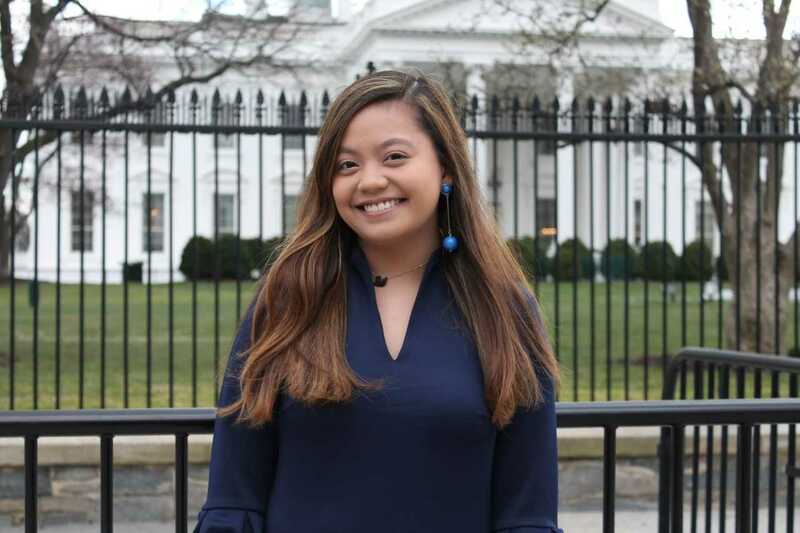 Senior Aleanna Siacon traveled to Washington DC on March 7 to speak at a Wayne State University Alumni Reception with President Wilson and three other Honors student to share her Wayne State experiences. Below is a summary of the trip in her own words. Zooming past monuments, connecting with like-minded students and having the opportunity to shake hands with incredibly accomplished Wayne State University alumnus who are so willing to support students made me realize, that within this moment, I truly stand on the shoulders of giants. I was so fortunate to have the opportunity to travel with a group of three other students to our nation’s capital for the Alumni Reception with President M. Roy Wilson on March 7. Although we’re all on the university honors track, we each had such diverse backgrounds and specialized in different disciplines: chemical engineering, public health on the pre-med track, political science on the pre-law track, plus me -- a triple major in journalism, political science and history. I really enjoyed our conversations and hearing everyone’s stories. It was crazy to think about how we all lead such different lives, how we all ended up studying at WSU and how we ended up on stage answering questions with President Wilson that night. Everyone had such drive, such passion and such energy. Although we’re still so young, ranging in ages 19-21, all of us had accumulated professional experience, conducting research, completing internships and all of us had already been actively working within the fields of our choice. It’s exciting being around people who are excited about what they’re doing, and it was really heartening to look around and know that we come from an institution that has supported us so well. In addition to the strong programs, support systems and opportunities within our individual colleges and specific departments/programs, the Irvin D. Reid Honors College played a key role in providing us with scholarships, pushing us in our studies so we’re well-rounded and think critically, and giving us connections that lead to integral experiences. At WSU, we’ve done more than just get an education, we’ve been cultivated within an educational space that has worked hard to give students like us absolutely every opportunity and resource possible. Walking into the reception with my classmates and meeting some of our DC-based alumnus, it hit me how this university has served as a launching pad for so many people. I met professional journalists working on the frontlines of both national and international stories, Fulbright winners, sharp legal minds with experience working on Capitol Hill, engineers, doctors and more. These were such cool people who went to WSU, sat in the same classrooms I sit in, some graduated from the Honors College or some of the same programs I’m currently in. Yet, what was most resounding to me, was that all of these fellow Warriors were so willing to get to know us and then immediately offer to help us in any way that they could, whether it was just providing some advice, offering up the opportunity to connect us with someone they knew that could help or giving us their business cards so we could stay in touch. Our WSU alumni in DC kept telling us how proud they were of us and how they wanted us to see us go far. As a student, the day-to-day grind can be difficult at times. All of the deadlines, exams, work on top of school, staying involved with campus organizations can overwhelming, and there are plenty of days where I wonder if I can do this. The day of the reception was a tremendous reaffirmation that I truly can and I have this expansive network of warriors who want to support students who come from the same place they started off at.